illus. by Frank Morrison. 48p. bibliog. Crown. Oct. 2018. Tr $17.99. ISBN 9780399550249. 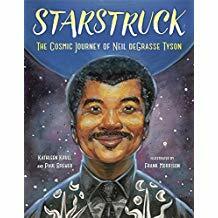 K-Gr 3—This picture book biography of Neil deGrasse Tyson perfectly conveys his fascination with space and determination to study it. Authors Krull and Brewer trace his journey full circle from his first trip to the Hayden Planetarium to his current role as the planetarium's director. Morrison's illustrations show Neil's "starstruck" wonder, as well as his energy and enthusiasm. Spreads that feature Neil and the night sky showcase him in the perfect setting. The text is upbeat but honest about the challenges he overcame to reach his goal. Key events, such as viewing a solar eclipse aboard a floating laboratory, meeting Carl Sagan, and the uproar of reclassifying Pluto are included. The author's note gives more details about Neil's background, education, and family; there is also a list of sources. This title would work well in a unit on space or contemporary biographies. VERDICT A stellar biography for young readers who have their eyes on the stars. Highly recommended.